Confession time again: I am a huge nerd. I’m not really the computer-game-playing type nerd, nor the maths nerd or the science-y nerd. I’m a book nerd. I adore reading and books, stationary, writing. I love to read. I used to stay up till all hours, reading. Once I started reading, then forgot the time and forgot to tell my parents good night. It was pretty late (for me – I don’t know how old I was, but young enough that ten thirty was pretty late) by the time I got up and said, I’m sorry, I forgot to say good-night. Actually, I still stay up till all hours reading sometimes. I also used to spend my lunchtimes at school reading in the library. Not for my entire school life, but I didn’t always have friends to hang out with, so I’d go to the library and read. And chat to the librarians. I got to know my librarians really well. I’m now out of school, at uni, doing well. I still love to read. I still like my librarians. And since I’m home this week, I went to visit school with my sister. Yes. We visited our old high school. We are major nerds. Also, our dad works there (hi, dad!) so we’ve always been friendly with the teachers. We went around and visited people and marveled at the fact that there were many people we didn’t recognise. There were a lot of them. Some were people who’d grown up, some were entirely new. And I brought brownies to share. Teachers are known sugar addicts (wouldn’t you be, if you had to deal with teenagers all day?) – we used to have chocolate fundraisers for various things, and we’d only have to ask Dad to bring a box to school. They’d be gone within the week. A few days, usually. 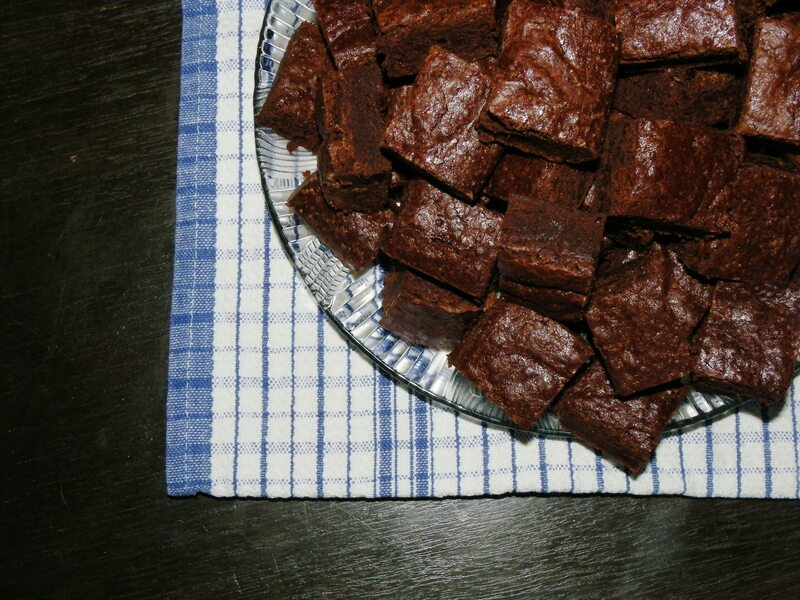 So I knew the brownies would be well-recieved. Plus, Dad likes showing off his daughters, especially since they bring treats, so he offers them around. 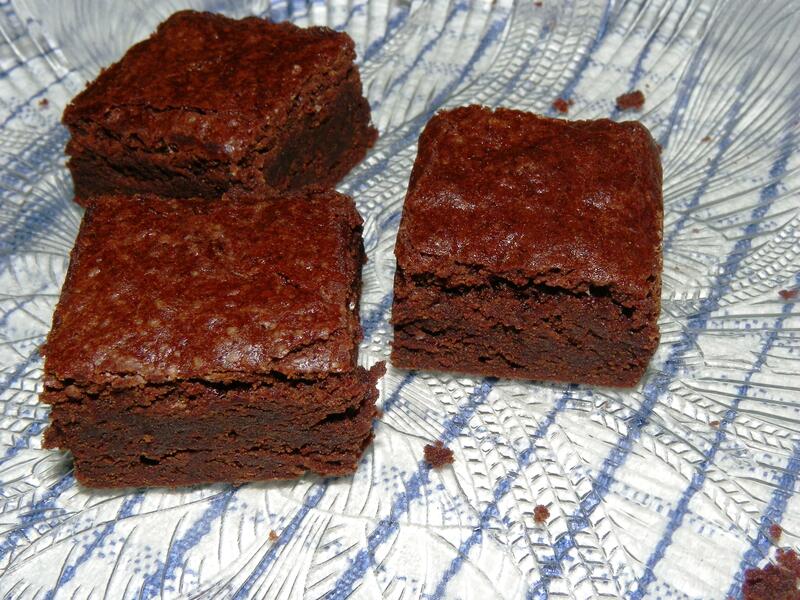 These brownies are legendary. They’ve been around the web for a while now – it seems as though every man and his dog has made and written about them. For good reason. The chocolate in them comes from cocoa, but don’t stop reading there – it’s really amazing. There’s a little over a cup and a half of cocoa in there. That’s a lot of chocolate. 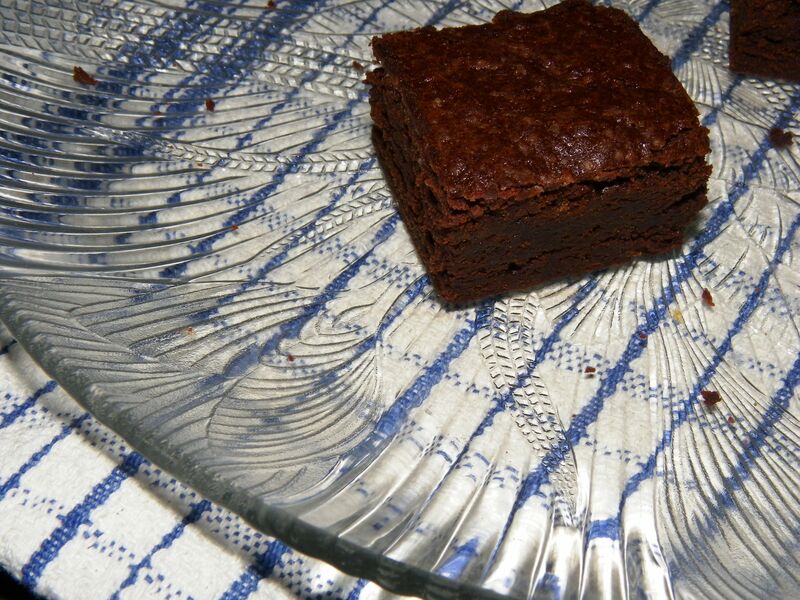 And mixed with the butter, sugar, a little flour and some eggs, you’ve got yourself a dense, fudgy, cakey brownie that pleases many palates. I doubled this recipe because I had a slightly bigger pan and because I’d heard around the web that they were a little on the thin side. 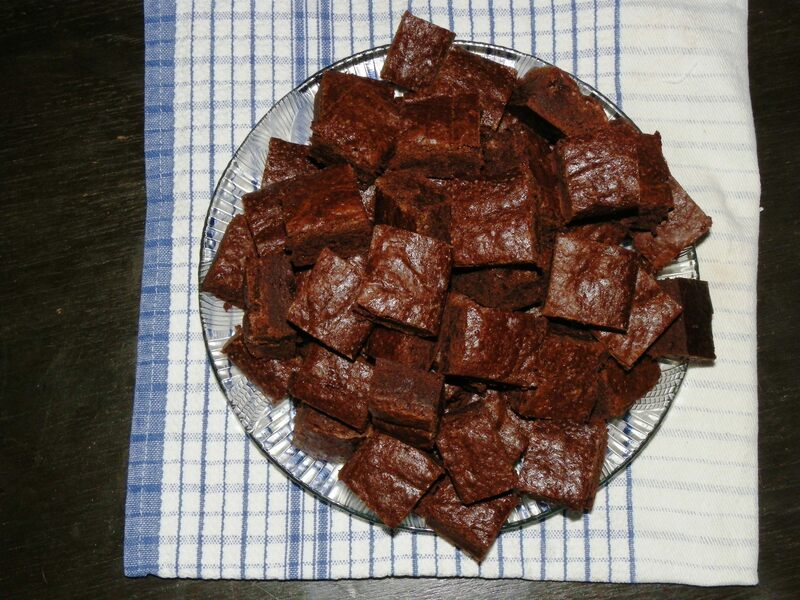 My doubled recipe made in a 9×13″ pan (I think…) made over sixty small brownies. They are the perfect size to freeze and eat later, and also the perfect size to share. Preheat oven to 170 degrees and put a rack in the bottom third of the oven. 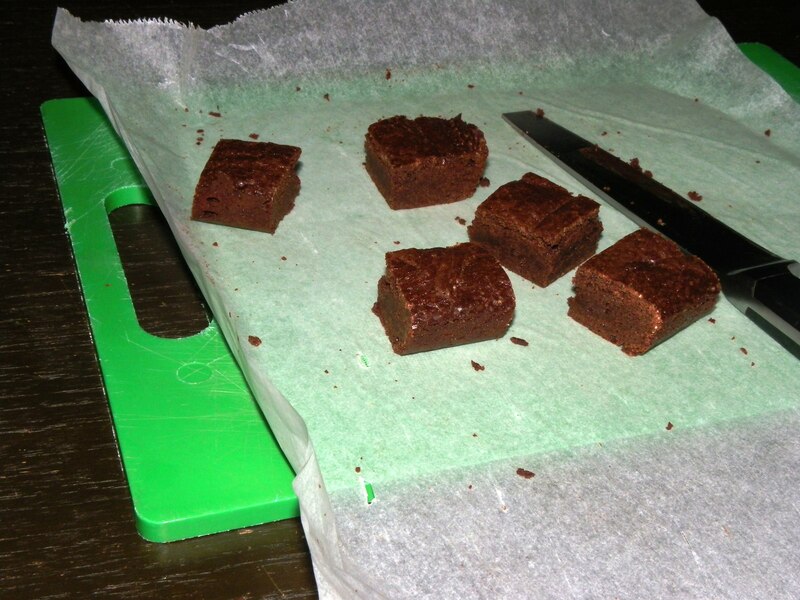 Line a baking tray with baking paper, leaving overhang so you can lift out the brownies once they’ve been cooked. Put the butter, sugar, cocoa and salt in a heatproof bowl – pyrex or metal or glass – and place over a saucepan of simmering water. Stir until the butter is melted. For me, I didn’t feel I cut the butter into small enough pieces, so for a little while there it didn’t look as though it would work. 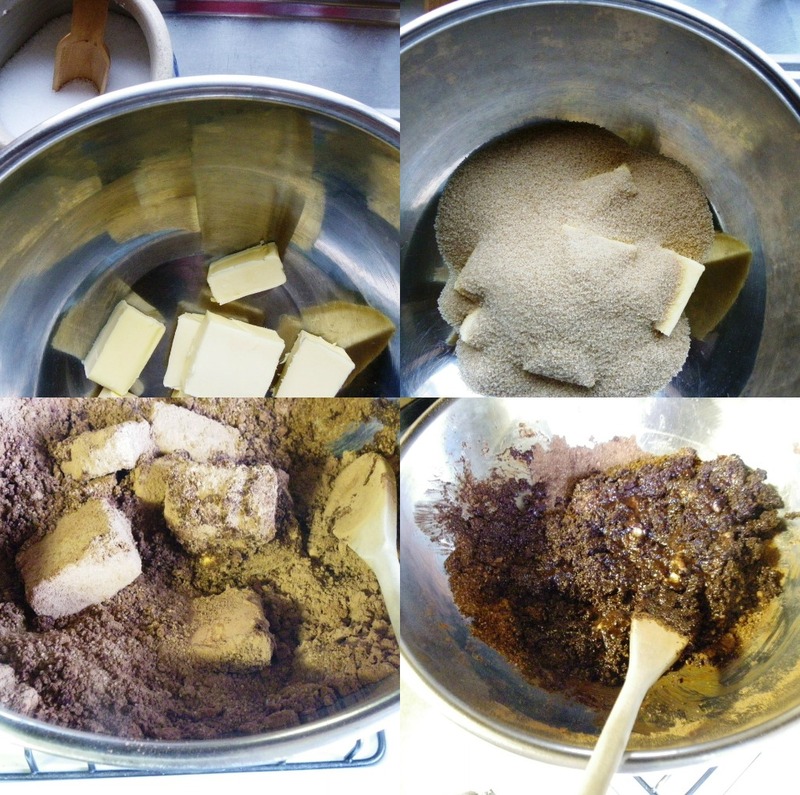 Fortunately, eventually, the butter melted and it looked grainy and sludgy and black and not smooth. Stir in the vanilla with a wooden spoon, then beat the eggs in one at a time, vigorously. Add the flour and mix until just incorporated. Now it should be just right – smooth and silky. Pour into the prepared pan and bake 25-30 minutes. Let cool 5 minutes in pan and then lift out, leave until cool and then cut into squares. Eat. Or freeze and pretend to yourself that this makes you eat less. 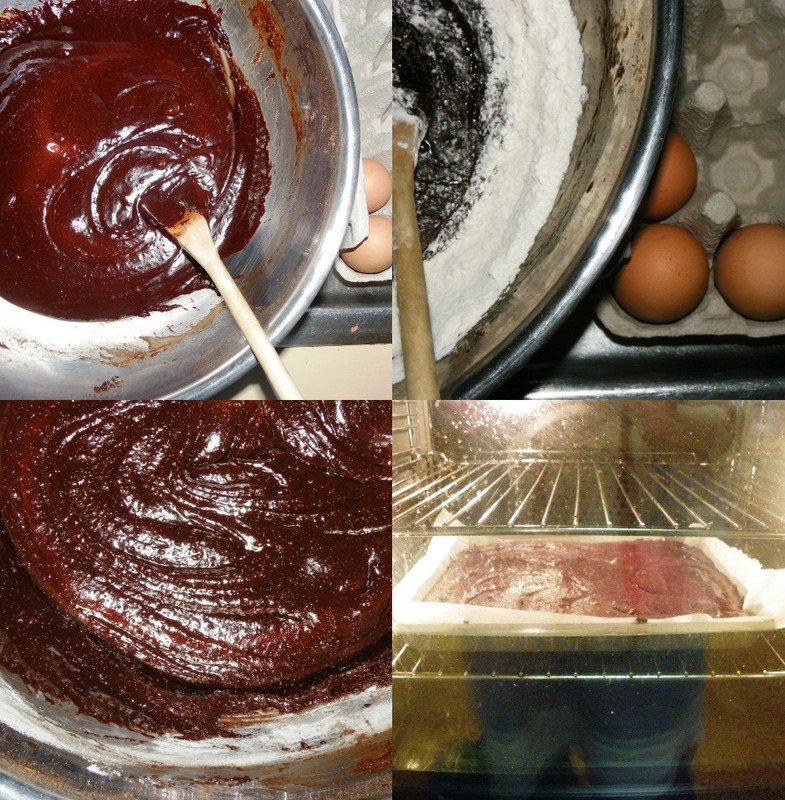 This entry was posted in chocolate and tagged baking, chocolate, family, happiness, nerd. Bookmark the permalink.